The holidays are approaching (and even if they weren’t, there are always birthday gifts to wrap!) I’m always looking for pretty, yet inexpensive wrapping solutions. 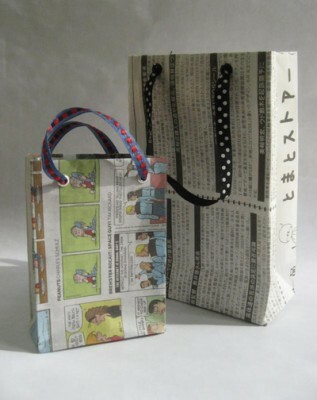 I like the look of using newspaper to wrap boxes, but I really like the convenience and re-usability of gift bags. I did a little digging on the internet and found a few tutorials on how to make gift bags. I figured out what works best for me, and wrote up a tutorial on how to make gift bags like the ones pictured here. These are really easy to make! Click here to see the tutorial so you can make some bags of your own. Thanks for sharing the tutorial. I didnt buy any wrapping papers or gift boxes this year. I have sewn some gift bags. These gift bags can be recycled.